Pen to paper as they say….. It has been a long while since writing and much has happened in my life and many miles have been traveled to create new movement and activations. Nearly 2000 miles this time. Of course not everyone has to take such dramatic journeys as I do to get the movement going but please know we all do have to move out of stagnation to begin a new creation flow. I go between being a Hermit on the mountain top, who after time, goes into the safety of aloneness and distance and then wonders why nothing is happening. The void or aloneness is good for a while, to gather energy, thoughts, ideas and presence. For formulation and creation of ideas into material form or possibilities….yet if one rests there too long without the wisdom of movement, the revelations gained can dissolve as dust only to be carried away by the winds. Travel is what pushes such movement for me when I have not quite paid attention or perhaps more correctly, wish to avoid “the doing.” Travel, the road unfoldin g ahead with a direction in mind yet no other knowing present. “Where to stay, which route, who to meet, what to see” are all filled with ?? until immediate arrival and then surprises…..which can be taken any way one wants! 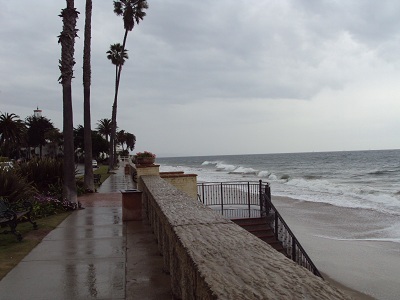 My first “destination” was to be Santa Barbara, CA on the West Coast touching the Pacific Ocean. Since first arriving in California I had been told I should visit here, it might be a place to live. Well as lovely as it is, the Spanish influenced architecture, the beaches, beautiful homes and rolling hills….it is not for me. I didn’t resonate w ith the energy/feeling that comes from the land and environment. 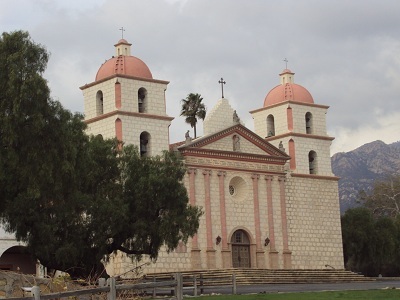 The Old Santa Barbara Mission was founded in 1786 and now offers a glimpse of the past in the Cathedral, buildings, museum, gardens and shop. Most of the street names in the city are of Spanish origin. 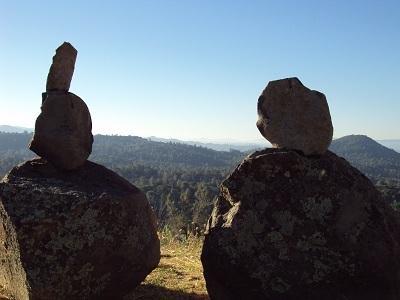 There is very little left of the native Chumash Tribes who resided here long before the Spanish arrival. I drove north on the famous Highway 1/101 passing small and somewhat touristy beach towns, nice yet quiet because of the winter temps and rain that day. Further on the landscape widened to pastures, hills, vineyards and orchards….this was good. 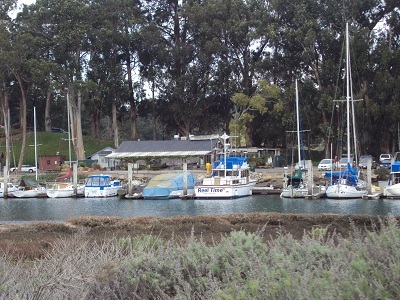 About an hour north of SB is San Luis Obisbo, smaller and a more inviting area for me. 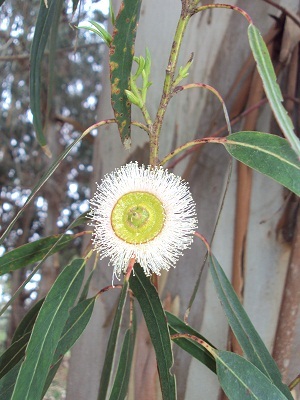 Just north SLO and branching off Hwy 101 is Morro Bay…and this was lovely. I actually arrived way after dark on my first night out, semi lost to be honest. 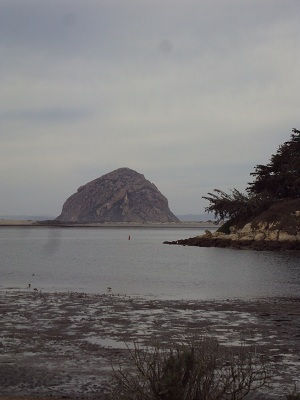 I found the Morro Bay State Park and decided to camp. All was quiet, dark and it was quite cold. Found a spot and started to unload and put up my tent. Out of the darkness came a young woman with a small child offering to help. How lovely it was getting to know them in the dark and mess of the tent. When all was done they went back to their tent with laughter filling the darkness. Next morning such a surprise awaited…..this was a lovely location in so many ways. Trails, beach, restaurant, marina, town, inlet, museum and the Huge Rock! Leah, Chad and Marley came to visit and shared their knowledge and tips. This young family were a delight! I spent the day exploring, both by car and on foot. I decided to stay here for another night instead of another great move. Late in the afternoon the rain came and continued through the night….thankfully all stayed relatively dry and once the clouds cleared around noon it was very pleasant. In the early evening, over a glass of wine beside the fire I learned more of these lovely people. Leah, Master’s Degree in Education, Teacher, both public schools and private home schooling. Chad had been in many different areas of employment yet now he was “stay at home Dad”, doing and being with 3 year old Marley. I was so impressed by how Leah and Chat looked at the situation and that this was more of a door closing for another to open. (In fact the day I left new housing possibilities were presented to them.) They had belongings in storage, with just the basics with them. Her realization at just how much “stuff” is not needed, that she was now planning to sell or give away filled us with laughter. She looked at my car and heard my short version story and then said “the reason you ended up here was to help us realize and show all is well and we are looked after.” Such a precious gift to be given! This day also happened to be the time of Full Moon. Before leaving on the third morning I brought out the portable labyrinth and invited them to walk it. All accepted. After explaining the hows and whys, with the drum in hand Chad walked the paths in and then out. Part of the magic is revealed when I “dowse” the walker’s energy field going in before and upon completion. To see the amazement in their eyes when I keep walking further and further away, holding the dowsing rod and their energy field. Ten, twenty, thirty, fifty, hundred feet and more, much more in some cases, only stopping when the points of the rods open or disconnect from the field. 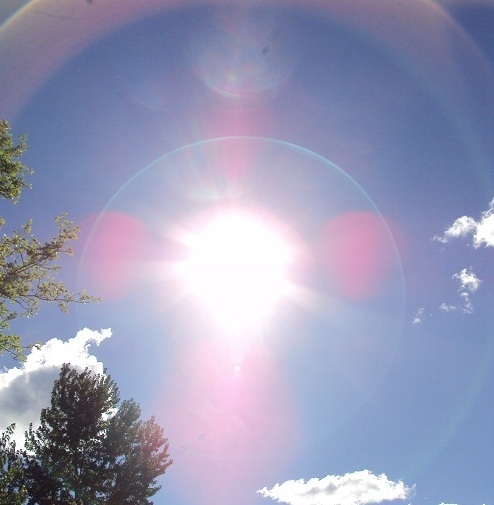 “This is your potential, your field of energetic influence when you are grounded and in full personal power. The feeling you have now is to be remembered when doubt and fear present themselves to you!” Chad looked completely different! Leah followed with her own experience and of course little Marley loved to run round and round on the bright colored paths. How blessed I was to be able to share with such special people. This is why “Spirit” wants me off the mountain, cave or abyss….to share when the time is right! 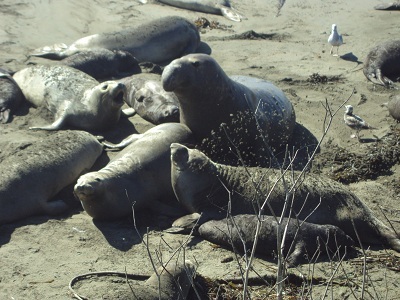 Leah mentioned a visit to the Northern Elephant Seals Rookery is a must and pointed me in the right direction. 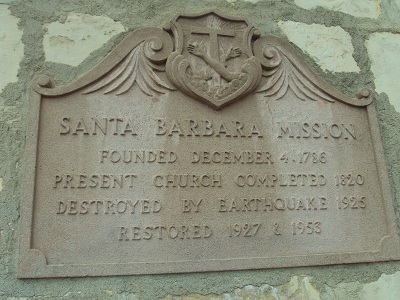 Further north on Hwy 1, north of Hwy 46 from Paso Robles, 3 miles north of San Simeon, the location of .WR Hearst’s Castle. What an amazing place! 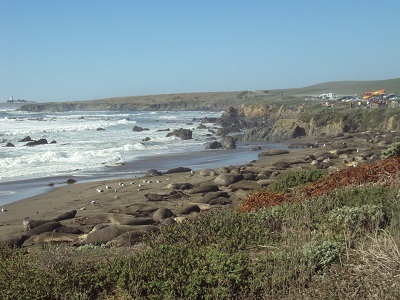 One small inlet beach on this Pacific Coast was the home for hundreds of huge seals from December to March every year for hundreds, if not thousands of years. Plenty of other little beaches but no seals! They come here to give birth to the new generation and mate for the next one. The site was not without sadness…..I noticed 10 or so of the young pups had died and the sea gulls were feasting. Some of the mothers moved in to protect the bodies at least for a while. Well signed, plenty of parking and a well laid out boardwalk just 15-20 feet above the beach. 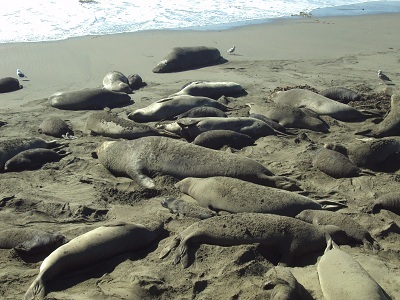 The air was filled with bird’s sounds and seal moans, grunts, conversations amongst themselves that ranged from gentle loving to angry orders by males “wanting their way!” The females sound responses bordered on “leave me alone, I have a headache, you are squashing me!” Species are not so different after all! The pictures do not do justice of course. Visit this website for more information. I’ll close off for now……enjoy the ride!